Winter Radishes are known for their creamy white exteriors and tender yet crisp bite. 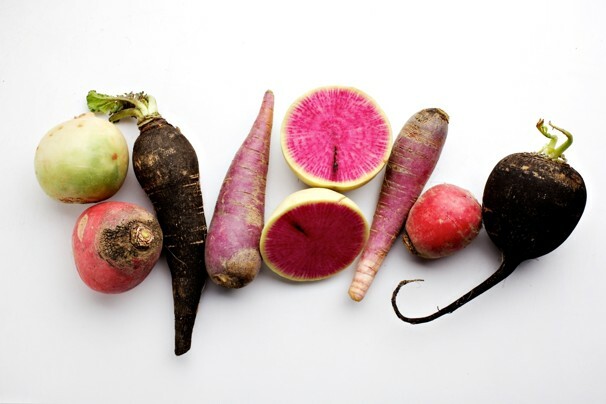 The most famous of varietals is the watermelon radish, whose flavor is mild and slightly peppery with sweet notes. 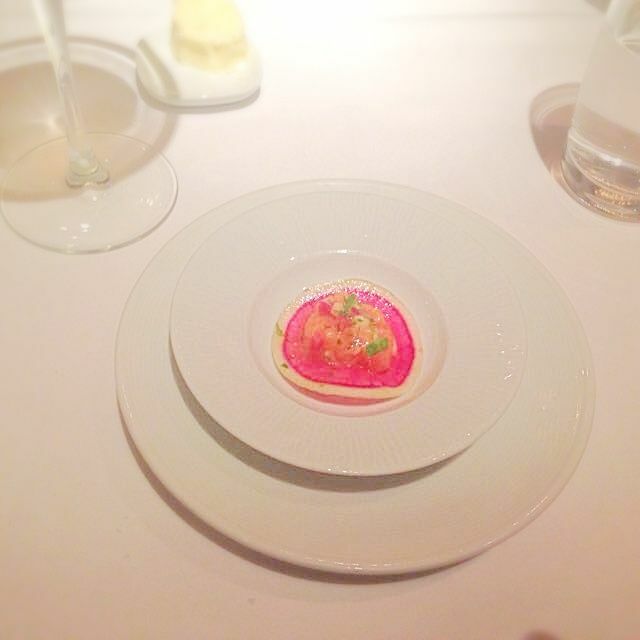 Winter radishes can be served fresh or cooked, hot or cold. They pair well with fennel, apple, cheeses such as feta and chèvre, especially butter. How to Buy: Look for radishes that are smooth, brightly colored, with tops that are green and fresh looking. (You can cook with the tops, makes a great pesto!) Avoid radishes that are soft, have white or brown scars, cracked, or black spots. 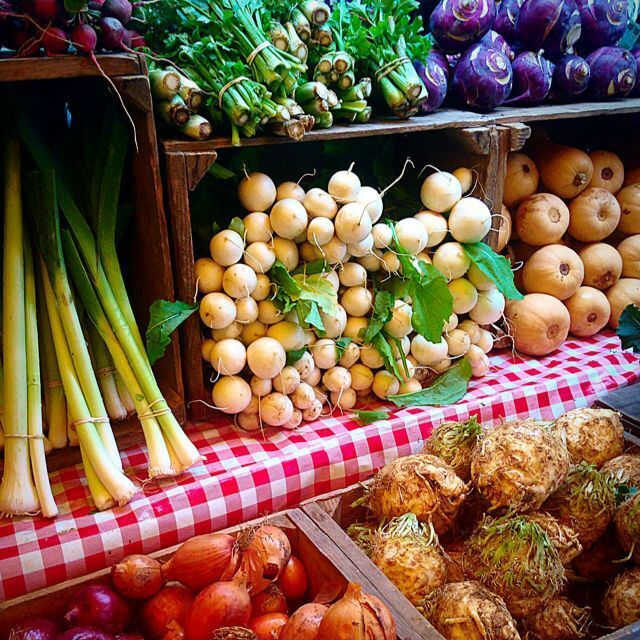 If the radish tops are yellow, limp or slimy, the radishes are old or have not been stored properly. How to Store: Winter radishes store well in the refrigerator once the tops have been removed. The radish leaves cause moisture and nutrient loss during storage. Winter radish varieties can be stored for up to two weeks in the refrigerator. Method: Peel the watermelon radish and thinly slice. If you have a mandolin, use it. Heat the oil in small pot on medium heat. When hot, toss a handful of radish, making sure that you don’t crowd the pot. Fry for approximately 8-10 minutes until really brown. You’ll be tempted to take them out earlier, but you need them to crisp up. They do take longer to crisp than potato chips. 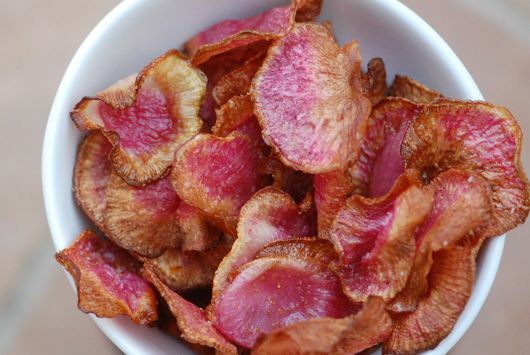 Place fried watermelon chips on a paper towel. Season with cumin salt (mix above ingredients in a small bowl). Method: In a small bowl, stir together the shallot, 1 1/2 Tbs. lemon juice, vinegar and a pinch of salt. Gently stir in the avocado, season with salt and let stand for 10 minutes, stirring occasionally. Whisk in the olive oil to make a vinaigrette. In a large bowl, combine the lettuce, radish and cilantro. Stir in the vinaigrette and drizzle over the salad. Toss gently and season with salt and more lemon juice, if needed. Transfer the salad to individual plates and serve immediately.